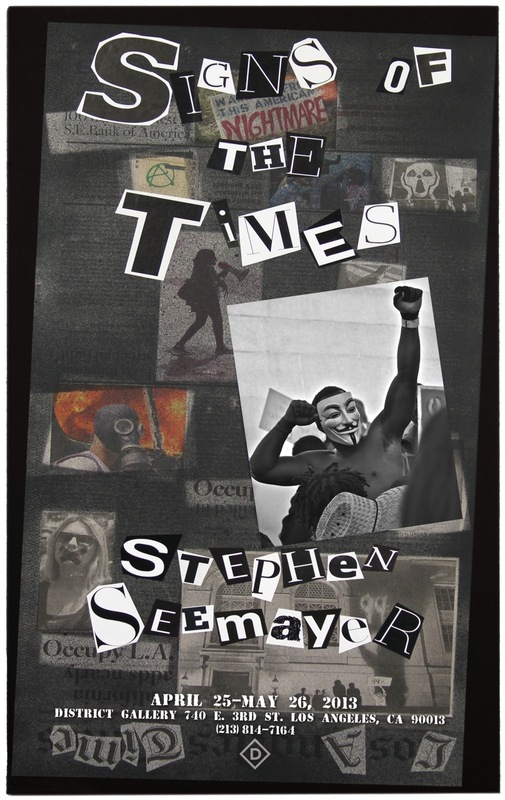 Artist Stephen Seemayer will exhibit new works based on the tumultuous two months of Occupy L.A., when activists took over the City Hall lawn demanding greater economic equality for the 99%. During October and November 2011, Seemayer and his wife, photographer Pamela Wilson, spent time nearly every day talking with and documenting the occupiers who were camped out in tents and makeshift shelters around L.A.’s Civic Center. The protestors were not only showing solidarity with their brethren of Occupy Wall Street in New York, they were also pressing for more fairness and compassion for working class Americans. They urged a shift in values and a closing of the rift between the 1% of the wealthiest in our society and the rest of the American people who are facing foreclosures, unemployment and loss of benefits in this era of rampant corporate greed. 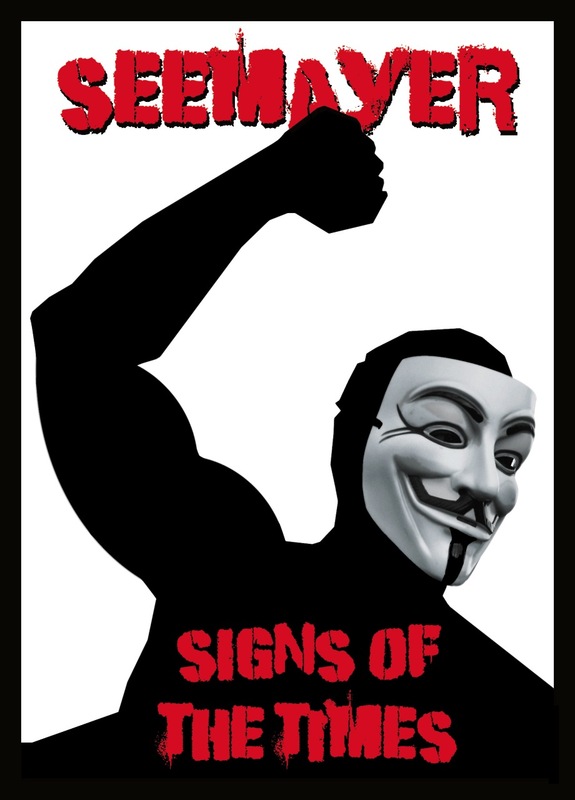 Seemayer’s energetic collages incorporate the slogans and signage that got the occupiers’ messages across, along with photographs of life on the lawn and with graphic stencils of raised fists and other revolutionary symbolism. Each is built on a reconstructed front page of the local paper of record, the Los Angeles Times — which is headquartered coincidentally across the street from City Hall — for each of the 61 days of the occupation and for the last night when thousands of police in riot gear and hazmat suits stormed the site and evicted the protestors. 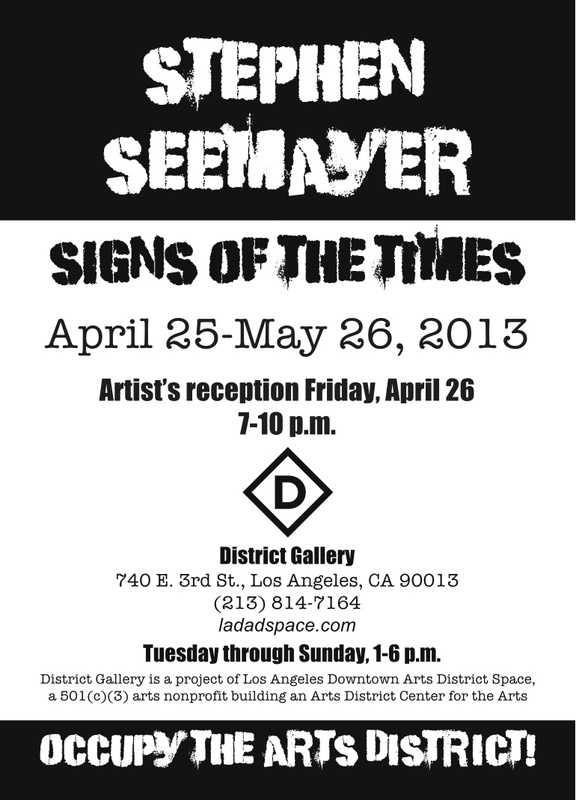 The exhibit opens at the District Gallery in Downtown L.A. on Thursday, April 25, 2013, and runs through May 26. AN ARTIST’S RECEPTION WILL BE HELD FRIDAY, APRIL 26, FROM 7-10 P.M.